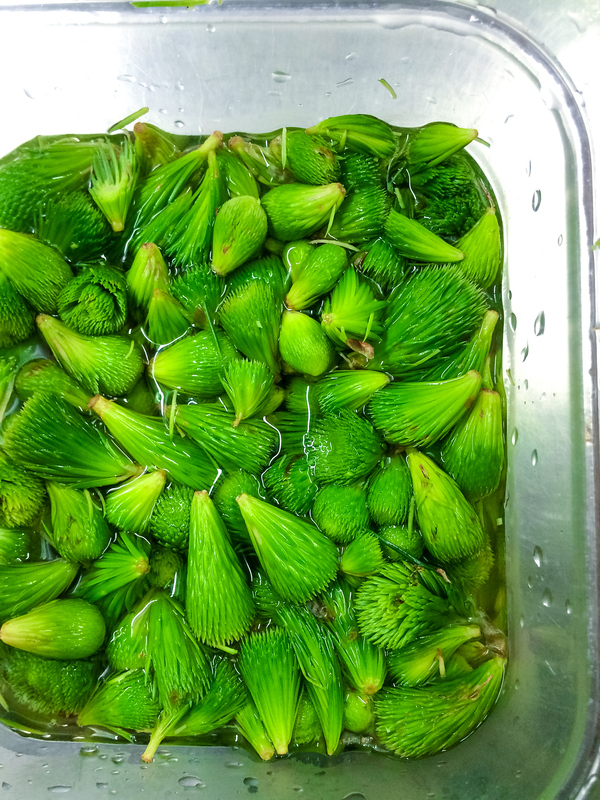 This spruce tips make an amazing bright, citrusy vinegar. With only 2 ingredients it takes less than 10 minutes to make. The interesting balance in my life is that while I travel the world to discover international food, at our restaurant Loka, Dave explores Canadian cuisine and pushes to better understand Canadian food. Today was all about spruce tips. We don’t have a long culinary history in Canada but what we do have is vast land for amazing ingredients and so “Canadian food” is really ingredient driven. The ingredients may not be ones you necessarily recognize as edible plants but that’s what makes Loka so fun. Evergreen trees always remind me of home, sure they exist on Lana’i and much of the United States but for me they are Canadian. Spruce tips are available in Canada each spring, essentially they are a bud at the end of the branch. Sometimes called spruce candles, spruce tips are signs of new growth. Every spring the end of almost every branch has a bud-like tip that sheds a brown paper husk and produces a new bunch of needles. They have a bright, almost citrusy flavour but not overpowering like pine, which makes them great in both sweet or savoury foods. Dave makes a batch of spruce tip vinegar every spring and loves using it. When asked what his favourite ingredients is most are shocked that he’d say vinegar but he says it’s one of the most versatile ingredients, especially as you can season food without salt by using vinegar. While the obvious answer is the forest or your backyard, if you live in a city like us that’s not always possible. Head toward your nearest farmers market and look for the stall with your local forager. Even if they don’t have spruce tips on hand they’ll likely be able to bring them in. If you’re near wooded areas look for them in early spring, they are a vibrant light green and are perfect when they begin to shed their brown husk. They are tender and can be picked just like berries. You need to catch them before they grow out as they harden and are too difficult to use unless you dry them for tea. 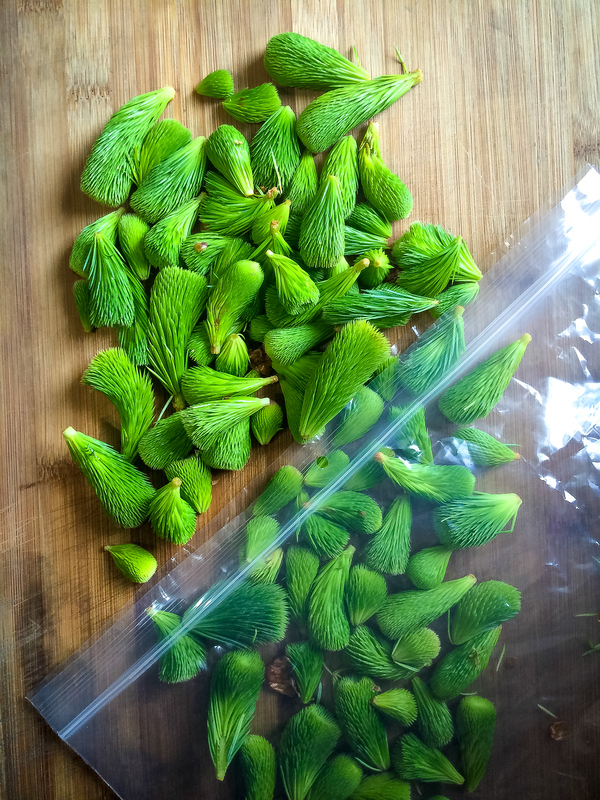 Here’s a great video showing spruce tips on the tree and also how to make spruce tip jelly. Please keep in mind when foraging edible plants that you shouldn’t take everything. These tips are the new buds for the year so pruning is great but you’re also hindering growth if you take too much. The general rule of foraging is less than 25% but ideally under 10%. Interested in foraging? Read: A Beginner’s Guide to Foraging Edible Plants. We use cider vinegar for ours but this is a flexible recipe and you could use a different type of vinegar, as well some people add peppercorns but we keep ours plain as it’s more versatile. Bring cider vinegar to a boil, pour over spruce tips. Divide vinegar and spruce tips evenly into mason jars. Use immediately or put into a dark space for six week, the flavours will continue to develop and intensify. What Else Can You Do With Spruce Tips? Medicine: High in vitamin C, our First Nations communities have used spruce tips for everything from sore throats to congested lungs.